The explosion of iPhone and iPad apps means you can now make music anywhere and no matter what your budget, the ability to jam and play is now in the palm of your hand. Here are some of the best value for money interfaces for Mac, iPhone and iPad to get you jamming and playing guitar fast, or recording your own compositions. 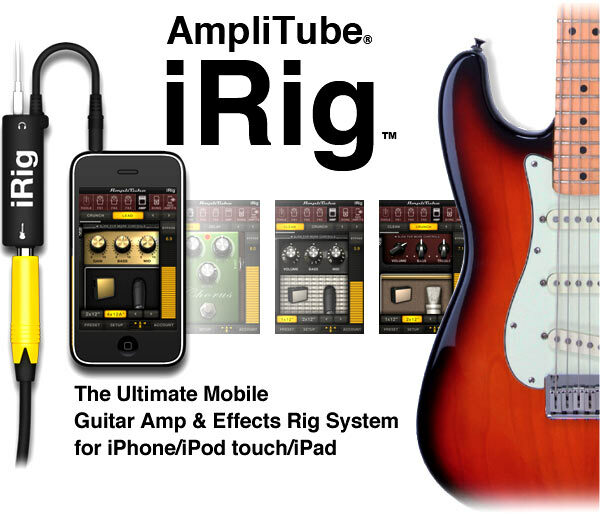 Amplitube is a FREE app from the app store that transforms your iPhone,iPad or iPod touch into a recording studio – all you need to buy is the iRig adapter that conveniently connects your guitar or bass to your iPhone or iPod Touch – at the moment the iRig interface is priced at only $39 dollars or 29 Euros. Play and practice guitar anytime, anywhere with realistic tones and effects, including the official Fender™ tone, plus full multitrack recording capabilities. AmpliTube FREE simulates a live guitar rig giving a choice of 3 effects pedals / stompbox effects – (delay, noise filter and distortion) running into an amp-head with effects plus a speaker cabinet and 2 microphone simulators and if you want to start off with great sounding guitar AmpliTube has presets to get you up and running and memory to store your own sounds. You can easily jam or play along with songs or backing tracks by importing them directly from your iPod library from your computer and a digital chromatic guitar tuner and metronome are also included. Amplitube also comes with SpeedTrainer which allows you to slow down all your favourite rock guitar riff so you can figure out exactly what your favourite guitar hero is really playing: Jimi Hendrix, Eric Clapton, Slash…. You can expand your rig with up to 11 guitar effects / stompboxes, 5 amps, 5 cabinets and 2 microphones in the AmpliTube iRig app custom shop. 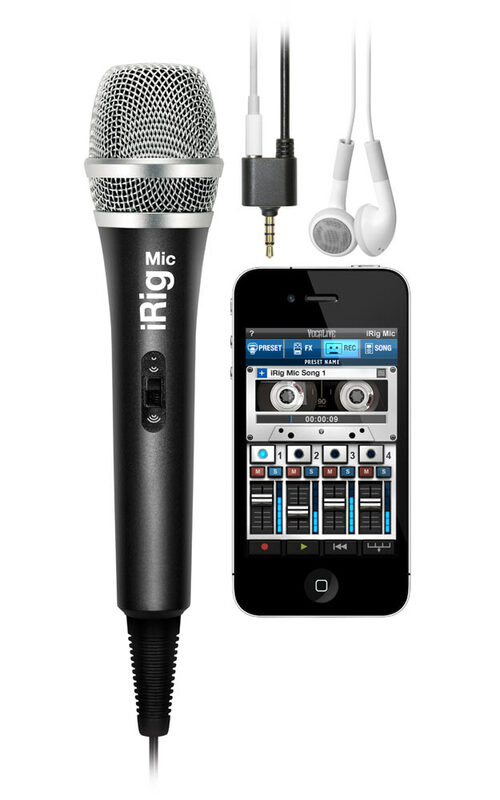 iRig Recorder is the companion, easy to use recording app, which when combined with the iRig microphone allows you to add your own vocal tracks / other instruments and complete your mobile recording studio. Garage Band is also compatible with the Amplitube Free app. Click here to check it all out and get playing guitar fast or if you really want to focus on using Garage Band on your iPad or improve the quality of your iPhone 4 guitar input the Apogee Jam is probably the next step up on the guitar or bass guitar ladder – click here to find out about the Apogee JAM interface. Yeah that is pretty awesome! This is awesome! Slash’s marshall is now on my iPad with this app! He even did a video explaining why he did it and pulls of some crazy solos like only Slash can! Crazy! Amplitube have joined forces with Slash to create apps for iPhone, iPod touch and iPad – also available inside the new AmpliTube 2.5 for iOS – and the inclusion of Slash’s signature gear into the cutting edge AmpliTube Custom Shop desktop/laptop app and plug-in for Mac/PC. The Rare Star Guitars collection features Slash 1988 Les Paul fitted with Seymour Duncan Alnico Pro II pichups.